On Friday 11th and Saturday 12th August we will be off to the Festival of Quilts at the NEC where we will again be “wearing some quilts” – if you see us do say hello! We are also going to meet with some of the Young Quilters volunteers to explore ideas about involving young quilters in making Memory/Fiddle Quilts. One possibility which we are exploring with year 7 & 8 in a school in Yorkshire is starting with “Carl and Ellie’s quilt” – those of you familiar with the Disney/Pixar film Up will know what we mean! Judy and I have both got talks to various quilting groups lined up in the Midlands and Oxfordshire in 2017 and 2018. We can travel further afield, if you would like us to come to near you please get in touch. 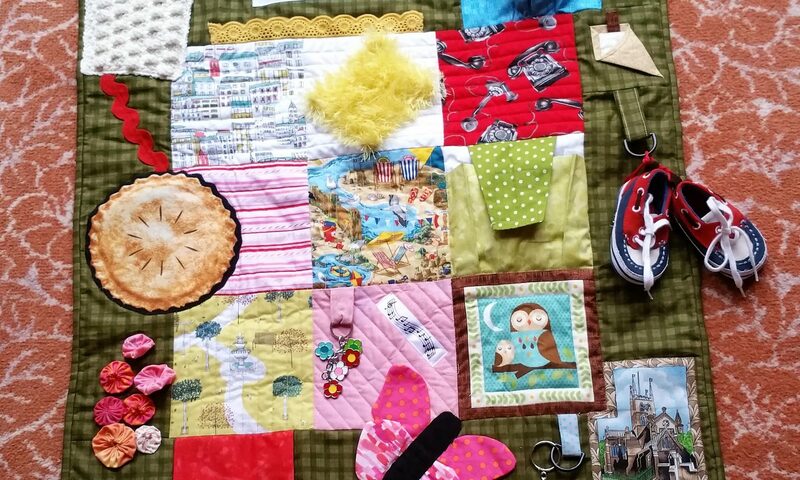 We are in early discussions with a couple of settings who are enthusiastic about having memory/fiddle quilts made for their residents – and a couple of potential venues to run workshops to make them. Are there differences in the kinds of quilts that work best according to the recipient’s gender? How could we involve young quilters in the making of these quilts?